AFTERMATH After the British crossing was repulsed, sporadic firing across the inlet continued the rest of the day and into the night. Colonel Thomson’s Advanced Guard was reinforced with Virginia troops who had been stationed at Mount Pleasant on the mainland. Troops on both sides remained under arms overnight expecting another attack, but the British made no more serious attempts to cross the Breach. Meanwhile, the Americans’ punishing defense of Fort Sullivan caused the Royal Navy to abandon their bombardment. Commodore Parker’s ships moved back to their anchorage on the outgoing tide after dark. By early August, the defeated invasion force had sailed away to New York. For the first time in the Revolution, American patriots had decisively defeated the mighty British army and navy in a major pitched battle. British general Clinton was criticized for his lack of aggressiveness at Breach Inlet, but further attempts would have been costly in terms of casualties. His large force on Long Island was no match for the water depth and currents and the brave and skillful American defense. Resolved, That the thanks of the United States of America be given to Major General Charles Lee, Colonel William Moultrie, Colonel William Thomson, and the officers and soldiers under their commands; who, on the 28th of June last, repulsed, with so much valor, the attack which was made on the State of South Carolina, by the fleet and army, of his Britannic Majesty. FRUITS OF VICTORY The Patriots’ stunning victory on Sullivan’s Island caused the British to abandon their southern strategy. The clear proof that determined Americans could defeat an invasion from the world’s greatest military power boosted Patriot confidence, reinforced the Declaration of Independence, and encouraged potential allies in Europe. During the next two years, Charles Town experienced an economic boom supporting the war effort while Patriots under General Washington fought the British to a stalement in the northern states. As the British fleet blockaded most other American ports, the port of Charles Town remained largely open to military and commercial shipping, providing a base for privateers and a safe harbor for patriot navies. The city of Charles Town remained out of British control nearly four years and loyalists in the area were left without Royal government support. OTHER WARFARE IN SOUTH CAROLINA A period of relative calm in the southern states followed victory on Sullivan’s Island. The last major battle in the North was fought at Monmouth, New Jersey exactly two years after the Battle of Sullivans Island. The main battleground of the American Revolution soon shifted to the South, beginning with the successful British Siege of Savannah in December 1778. In 1780, nearly four years after their devastating loss in the Battle of Sullivan’s Island, British generals Clinton and Cornwallis returned for the Siege of Charles Town. Supported by the Royal Navy, an army of 11,000 successfully occupied the city after a 42-day siege. The capture of Charles Town and surrender of nearly 6,000 Americans was one of the greatest British victories of the entire war. 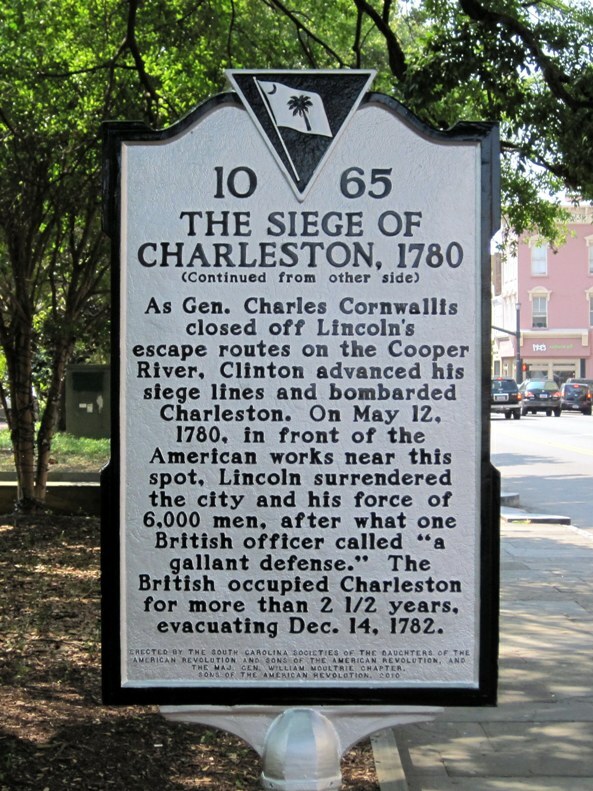 This marker commemorating the Siege is at Marion Square on King Street in downtown Charleston. The British occupied Charles Town and controlled much of South Carolina for more than two years after the Siege. People living in the state were divided – with staunch loyalists supporting the British royal government, rebellious patriots striving for independence, and many others just trying to survive the horrors of war. Patriot military resistence was especially tenacious in the backcountry, inland from coastal Charles Town. In addition to violent battles involving British troops, patriots and loyalists fought against one another in vicious guerilla campaigns. The patriots ultimately prevailed in this civil warfare among neighbors. As patriot guerilla fighters harassed them, British forces in the backcountry became overextended away from their supply lines and ultimately left the Carolinas. Lord Cornwallis’s army eventually surrendered at Yorktown, Virginia in October 1781. Patriots finally gained control of South Carolina after the last British troops withdrew from Charles Town in December 1782. 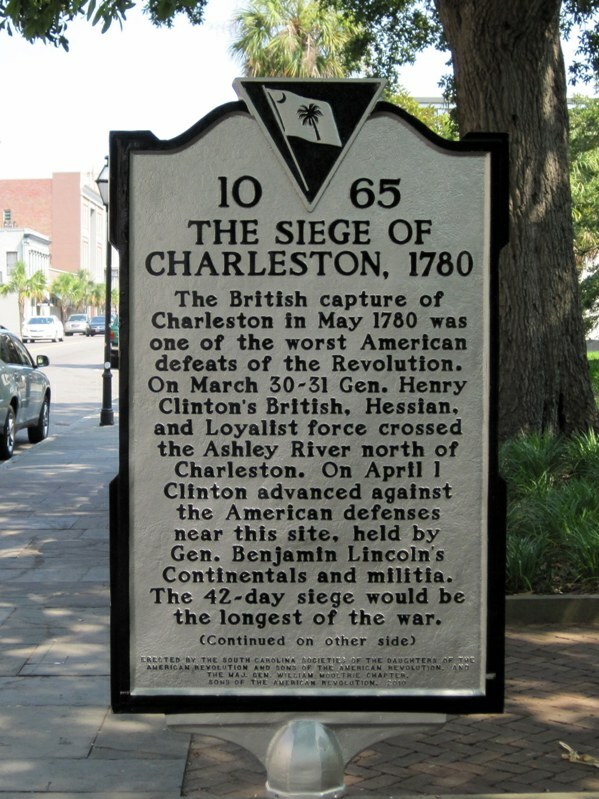 William “Danger” Thomson, Francis “The Swamp Fox” Marion, Thomas “The Gamecock” Sumter, William Moultrie and others who successfully defended Charleston in 1776 served admirably until the fight for liberty was won. When the war ended with the Treaty of Paris in 1783, the United States of America were free to govern themselves in pursuit of their revolutionary ideals. Prior to the siege of Charleston I don’t believe the tide of war entirely favored patriot forces. During the British’s second southern campaign, General Prevost repelled a joint American/French attempt to recapture Savannah, Georgia. After receiving news that control of Georgia was reestablished, Clinton decided to renew his campaign against South Carolina. Also, the while the British did in fact capture Charleston in May of 1780, they were unable to retain complete control of the colony between 1780 and 1782. Partisan resistance especially in the backcountry proved an obstacle for British regular forces and helped to keep most of the backcountry in a state of rebellion in the eyes of the British. I made some changes based on your comments.